What to do during the encounter? It doesn't matter if you have the world's best digital camera and a lens which takes photos of a bird's iris from 200 metres, you have to take some notes. A number of perfectly good records have been rejected by record committees because the submitter either did not take any notes or didn't submit any with the photo they supplied. A photo does not show every single plumage tract on a bird and some features that may not have been photographed (e.g. the underwing) may be crucial in the identification. Look at the bird closely, not taking your eyes off it until you have identified every feature that you can see (and hear if you are lucky). This includes not only the diagnostic field marks, but the details that would enable you to describe that bird (say on the phone) to someone else. Only once you have done this then you should you take pictures, if you have a camera, or write down your description, or both (taking pictures first). If you can sketch the bird, do so. Even if you are hopeless as an artist (and most of us are), you may be able to draw a wing or tail pattern, or a bill shape or pattern. If similar or other birds are in the vicinity, write down its differences from them. Record its appearance, behaviour, posture, and try to transcribe or describe its vocalisations. 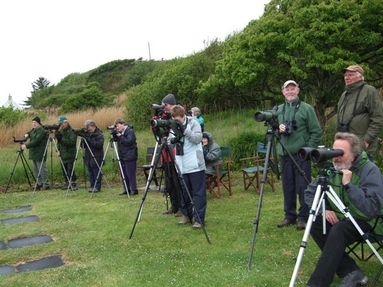 Many birdwatchers concentrate on observing and studying the rarity as long as possible, and then write notes immediately after the observation. Although this approach has its advantages, especially if the bird is difficult to observe or does not linger, there is always the possibility that some identification characters may be overlooked. Unless the bird stays around for days, there is little possibility of retrieving overlooked information. The likelihood of overlooking features is lessened if you scribble down notes during the observation, thus forcing yourself to look at the bird in more detail, rather than just observing basic identification features. Most people don't have a photographic memory! The hardest habit to break is looking at your field guide when you should be looking at the bird and writing down what it looks like. Force yourself to leave the books alone, at least until you have written the best description you can. If you add anything to your notes after consulting field guides, indicate which features were prompted by looking at the books (and specify which books). 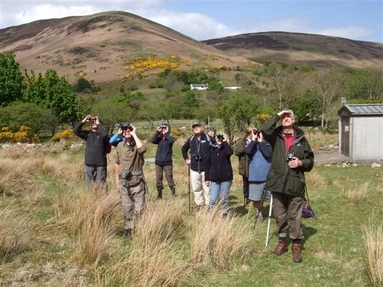 The points that can wait until after the bird has gone are the notes on your distance from the bird, the relative position of the birds, the sun, and you, the habitat, exact location, time and date, the optics you used, the names of your fellow observers, and your previous experience with the species. It is very important to mention features that were not observed, though, if you are aware of them. Some observers feel that mentioning things you missed is a sign of incompetence, but the record committee is more likely to look favourably on a record that has a lot of "I don't know"s rather than one that just seems a little too perfect. No matter how good your memory, the more time that elapses between the observation and recording the information, the more "fuzzy" or biased the details can become, if not forgotten altogether. Most birders would probably be amazed at their poor recall of plumage patterns and fine detail. Field notes do not have to be neatly printed; information scribbled on a scrap of paper is preferable to nothing at all. These notes, no matter how messy or soiled with mud, sweat, or food, constitute your original data, and, therefore, should be saved whether or not the information is later transcribed to a separate notebook or directly to a more formalized report. Just don't leave out any detail including: how close you were to the bird, how long you watched it for, its shape, its size, what it was doing, how it moved, any vocalisation, as well as the basics of plumage (head, tail wings etc), other birds that were around, the habitat and surroundings and finally what made you think that it was the identified species.